Just about three months after its unveiling ceremony on Aug. 15, Liberation Day, the newly restored Gwanghwamun plate is showing cracks. So far, two crevices one next to the character “gwang” and another near the “hwa” are visible to the naked eye. Choi Moon-soon, a Democratic Party legislator, said it is clear that the wood used for the plate wasn’t properly dried before being painted. 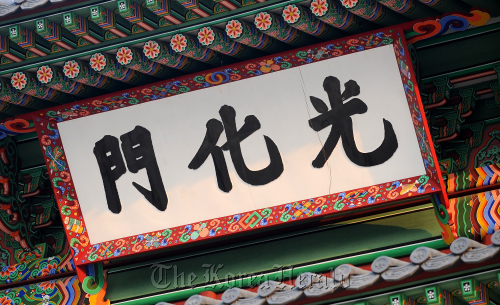 He accused the Cultural Heritage Administration of rushing the construction of the Gwanghwamun gate to unveil it on Liberation Day which marked the 65th anniversary of Korea’s liberation from Japan’s colonial rule this year back in August. The gate’s restoration process was originally slated to be completed by the end of the year. The Cultural Heritage Administration, however, said it was normal for the particular type of wood used for the plate to have crevices in dry fall weather. “We have used a kind of pine tree that can only be found in Korea for the plate,” said Kim Won-ki, director of the royal palaces and tombs management division at the administration. “The wood from the Korean pine tree has a tendency to generate crevices by itself in dry weather. Kim pointed out that other gate plates made of the same tree, including Daehanmun of Deoksu Palace, also have crevices on their surface. The administration is looking into ways to fill in the crevices following the advice of the experts, said Kim. A part of the Gyeongbok Palace restoration project, the restoration of Gwanghwamun started in 1991. The second phase of the project will continue in the next 20 years, aiming to restore 76 percent of the palace of the King Gojong era.